Kate has been a Drama teacher since graduating with a BA (Hons) in Drama and English from the University of the West of England in Bristol in 2012. Kate taught with the Bristol branch of The Helen O'Grady Drama Academy and is the Assistant Artistic Director of Makeshift Wings Theatre Company. 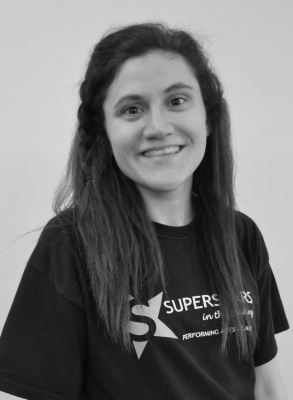 Since working at Superstars in the Making®, Kate has thoroughly enjoyed teaching the LAMDA acting syllabus and (can very proudly say) her LAMDA pupils boast a 100% performance exam pass rate. Another highlight for Kate has been directing RisingStars' sell-out summer musical production of 'Freckleface Strawberry' and assistant directing in both the Academy's 5 year anniversary Christmas showcase and the Musical Theatre pupils' summer showcase 'Let's Start at the Very Beginning'. Kate was also thrilled to step in for the role of Anita in SITM®'s Summer 2015 production of West Side Story. Easily one of the most enjoyable productions Kate has experienced to date. Kate loved acting alongside her SITM® pupils and fellow teachers. Prior to her degree, Kate enjoyed gaining a place as a founding member of the Young Actor's Studio at the Royal Welsh College of Music and Drama for its pilot year in 2008. Alongside the Young Actor's Studio, Kate trained as a dancer with the Gloria Hill, Sarah Burnell and Caroline Brown Schools of Dance. Kate thoroughly enjoys merging the two disciplines of Acting and Dance together, placing emphasis on the importance of movement within acting. Similarly, Kate is a huge fan of Musical Theatre, having performed in over 30 Musical Theatre productions to date. Having worked professionally as a Drama teacher, Kate has also been a working actress across the UK since the age of ten, enjoyed sell-out performances at the Edinburgh Fringe Festival with productions of 'Grimm's Brother Fairy Tales' and Chekhov's 'Romance With A Double Bass', playing Miranda in 'The Tempest' (good ol' Shakespeare) at Cardiff's Sherman Theatre and the Alma Tavern's revival of 'Spring Awakening' in Clifton, for which she won the South West Best Supporting Actress award - a proud moment - muti-rolling the parts of Ilse, Mrs Gabor and The Masked Woman. On screen Kate has appeared in numerous short films for the BBC's "It's My Shout!" scheme, and was shortlisted as a finalist for the Encounters Film Festival's Best Actress award (2012) for her performances as Alice in 'Wonderland' and The Artist in 'Expect A Masterpiece'. Kate is also a working scriptwriter, having enjoyed the dramatisations of her shorts 'Land of the Brave', 'Funny or Die' and 'Dancing' performed at the UWE, Jongleur and Bierkeller Creative Writing Showcases.